The Mytee HP100 Grand Prix 2 is a Large Capacity hot water upholstery extraction system. It includes all accessories such as the stainless steel upholstery tool, hoses & extractor. AUTO DEALERSHIPS LOVE THIS UNIT. Perfect for car seats, car rugs, RV interiors, hotel upholstery and anywhere truly powerful spot carpet or upholstery cleaning is needed. Top of the line in full feature machines! Featuring two 6 gallon tanks, hook up for your shop air compressor, 4 chemical dispensers drying attachments and vacuum attachments as well as on board storage. See videos here. The prep center is designed to be a virtual all in one auto detail work center. Includes just about everything except an air compressor. This is the answer to your auto detailing needs, all in one place. It’s the versatile Mytee® 20–110 Deluxe Prep Center™ automotive detailer. The first machine ever produced by Mytee®, it’s a longtime favorite of mobile detailers, car washes, used and new car dealerships, body shops, vehicle auctions and auto rental agencies. THIS IS NOT AN EXTRACTOR! It does NOT Vacuum. BASIC SPECIFICATIONS: * 120 Volts * 1600 Watts * Huge 4 liter boiler * Dry Vapor Steam Cleaner output * Hot Water Injection * 65 PSI * 9 foot steam hose * Extra long power cord * All Stainless Steel Construction * 100% portable. A Vapor Steam Cleaner, some times called a "Dry Vapor Steam Cleaner" is well suited for automotive upholstery & Interior cleaning, auto detail cleaning & softening and refreshing fibers. They are Not extractors! AUTO WORK: They are often used to dry clean seats and rugs in vehicles. They are great for removing sticky items such as gum, sugar and tar from rugs and upholstery. They also make a fantastic detail tool for blasting out tight spaces. OTHER USES: Commonly these steamers are used in the Janitorial business. They are used for cleaning Kitchens, Restrooms, Floor Grout Cleaning, Sanitizing, and much much more. THIS IS NOT AN EXTRACTOR! It does NOT Vacuum. USES In Relation To Janitorial & Automotive Detail Work: A Vapor Steam Cleaner, some times called a "Dry Vapor Steam Cleaner" is well suited for automotive upholstery & Interior cleaning, auto detail cleaning & softening and refreshing fibers. They are Not extractors! AUTO WORK: They are often used to dry clean seats and rugs in vehicles. They are great for removing sticky items such as gum, sugar and tar from rugs and upholstery. They also make a fantastic detail tool for blasting out tight spaces. OTHER USES: Commonly these steamers are used in the Janitorial business. They are used for cleaning Kitchens, Restrooms, Floor Grout Cleaning, Sanitizing, and much much more. THIS IS NOT AN EXTRACTOR! It does NOT Vacuum. BASIC SPECIFICATIONS: Most Extreme & Powerful all electric steamer! * 120 Volts * 1750 Watts * Continuous Fill * Dry Vapor Steam Cleaner output * Hot Water Injection * 145 PSI * All Stainless Steel Construction * 100% portable. A Vapor Steam Cleaner, some times called a "Dry Vapor Steam Cleaner" is well suited for automotive upholstery & Interior cleaning, auto detail cleaning & softening and refreshing fibers. They are Not extractors! AUTO WORK: They are often used to dry clean seats and rugs in vehicles. They are great for removing sticky items such as gum, sugar and tar from rugs and upholstery. They also make a fantastic detail tool for blasting out tight spaces. OTHER USES: Commonly these steamers are used in the Janitorial business. They are used for cleaning Kitchens, Restrooms, Floor Grout Cleaning, Sanitizing, and much much more. BASIC SPECIFICATIONS: Entry Level Extractor: * 11 Gallon Recovery & Solution tanks * 120 PSI Pump * Suction: 130" water lift * Power: Single Cord standard 20 amp outlet * 1200 Watt in line heater that produces temperatures up to 210 Degrees. ** Also Great for Auto Detailing BASIC SPECIFICATIONS: * 12 Gallon Recovery & 12 gallon Solution tanks * Adjustable 500 PSI Pump * Suction: 130" water lift * Power: Uses Two standard 20 amp outlets * Features auto fill and auto dump out. Just connect a garden hose for in and one for out and you can work all day long! 1600 Watt in line heater that produces temperatures up to 210 Degrees. BASIC SPECIFICATIONS: * 12 Gallon Recovery & 12 gallon Solution tanks * Adjustable 500 PSI Pump * Suction: 144" water lift * Power: Uses Two standard 20 amp outlets * No Heater. & features auto fill and auto dump out. Just connect a garden hose for in and one for out and you can work all day long! BASIC SPECIFICATIONS: * 12 Gallon Recovery & 12 gallon Solution tanks * Adjustable 50 to 1000 PSI Pump * Suction: 130" water lift * Power: Uses Two standard 20 amp outlets * No Heater. & features auto fill and auto dump out. Just connect a garden hose for in and one for out and you can work all day long! Great for Carpet, Tile & Grout or Upholstery! All in One! BASIC SPECIFICATIONS: * Two 9 Gallon tanks * 120 PSI Pump * Suction: 137" water lift * Power: Single Cord 15 amp outlet * 17" Chevron Brush for a wide cleaning path! The automated brush makes working easy! This is a fantastic large area cleaner - from hotels to homes. Also has wand ports! BASIC SPECIFICATIONS: * 12 Gallon Recovery & Solution tanks * 220 PSI Adjustable Pump * Suction: 200 CFM water lift * Power: Two 120 volt 20 amp for 1000W heat, or 2000W heat needs 20 amp outlet * Heater 215 Degrees. BASIC SPECIFICATIONS: * 12 Gallon Recovery & Solution tanks * 500 PSI Adjustable Pump * Suction: 230 CFM water lift * Power: Two standard 15 amp outlets * No heater. Just add Hot water or solution BASIC SPECIFICATIONS: * 12 Gallon Recovery & Solution tanks * 500 PSI Adjustable Pump * Suction: 230 CFM water lift * Power: Two 20 amp outlets * 1200 Watt in line heater 215 Degrees Max. Clean Carpet Faster, Deeper & Better!!! Get 240-Volts From Household Outlets! MSRP: $2499 You Save $200! Say goodbye to traditional wand carpet cleaning and hello to the industries newest Total Rotary Extraction tool the T-REX. This power carpet wand works with your own extractor! The head spins agitating the carpet while 6 jets apply solution & 6 suction ports extract the water from the carpet. MUCH more effective and faster than a traditional carpet wand. A true professional carpet cleaners dream come true. Allows you to Easily power 220 volt equipment from ordinary household 115V or 120V volt outlets. To use the converter, plug it into two common household outlets, connect 220v equipment and begin use. Access to 220 volt power is made easy, fast and safe without the heat and weight of a step-up transformer. These boxes allow you to quickly convert a 220-Volt or 230-Volt 30 Amp power source into two 115 volt, 20 amp high power outlets. The outlets receive any standard household 110 /120 Volt plug. One Converter offers a 3 prong 220v plug and the other has a 4 prong 220v plug. These plugs fit most common home laundry drier outlets in the US. They are the two most common plug plug types used in homes. & Water Injection + Cart & More! Injection + Cart & More! Heat, Power, Portability & Low Price! Size 30" x 20" x 42" 30" x 20" x 42" 30" x 20" x 42" 28" x 18 1/4" x 40" 28" x 18 1/4" x 40" 28" x 18 1/4" x 40" 28" x 17 3/4" x 37 1/2" 45" x 17 1/2" x 38 3/4"
Wheels 10" & 4" 10" & 4" 10" & 4" 12" & 5" 12" & 5" 12" & 5" 8" & 3" 12"
JUST RENEW-IT! The Future Is Now! Have you ever wondered where the future of cleaning equipment is going? The answer is simple. Bigger, Better, Faster and Green! ~ We are proud to help lead this revolution with our full line of world class Vapor Steam Cleaners and super heated portable carpet extractors. ~ Using state of the art technology and intuitive high tech designs manufactures are now beginning to create cleaning powerhouses. ~ Our finally crafted, Italian made Dry Vapor Commercial Steam Cleaners and Steam Cleaners were the VERY FIRST BRAND OF VAPOR STEAM CLEANERS EVER SOLD IN THE US. The competition falsely make this claim ONLY because they use to carry our product line! Even though they now carry a different product line, (not the original) they shamelessly continue to use this as a sales pitch. Ours is the most widely used brand of commercial steam cleaners in the United States Of America. ~ Note, "Vapor Steam Cleaners", "Steam Cleaners", "Steamers" and "Dry Vapor Steam Cleaners" are used interchangeably through the web site. ~ Our home and commercial steam cleaners have and continue to prove them selves and have been put to the test by HUNDREDS OF THOUSANDS of homes, hotels, motels, restaurants, fast food places, military bases, factories, supermarkets, janitorial businesses, commercial cleaning contractors and many more. The are a 100% PROVEN TECHNOLOGY! ~ Just Renew-It's Vapor Steam Cleaners, Carpet Cleaners, Steam Pressure Washers are HIGHLY RATED by our PROFESSIONAL end users. The proof is in the return. Once a company has tried our vapor steam products they often come back for more! ~ All of our vapor steam cleaners are CE certified. That is one of the highest electrical standards in the world. ~ Just Renew-It's sales team is made up of professionals that have ACTUALLY WORKED IN THE CLEANING BUSINESS. This makes all the difference in the world. Very few of our competitors can say that and even fewer can say that they have actually used their steam cleaner products in a professional manner. This hands on experience with Vapor Steam Cleaner technology gives us the edge. This combined with our vapor steam cleaners limited lifetime warranty and outstanding support and technical service makes us an industry leader in industrial supplies and commercial equipment. ~ Another big difference is at Just Renew-It! you will be treated with the respect you deserve. We will take as much time as needed to explain the difference between our many commercial vapor steam cleaners, hard surface cleaners, carpet extractors etc. You will find we have a wealth of knowledge that we openly share. ~ Just Renew-It! Is Unlike Other Vendors. We will NEVER try to sell you a steam cleaner, or any other piece of equipment if we feel it may not work for you or suit your application. In fact, we talk many customers out of sales rather then push them into something they don't really need. Our sales staff DOES NOT WORK ON COMMISSION! This means NO PUSHY Steam Cleaner Sales People. We go out of our way to make sure you are getting the right steam cleaner or correct piece of commercial cleaning equipment for the job. ~ Be aware that there are some dubious vendors that claim to be the worlds first, and the worlds best with millions of square feet of factory space (that is not in fact their steam cleaner factory, just their suppliers factory!) or sites that use phony, homemade and outdated "comparison charts" or "consumer reviews" to trick you into thinking that their unit is some how better. At Just Renew-It! we prefer to take the straight forward honest approach. ~ We promise fast service, straight talk and honest answers. Our faith in God, love of family and country are at our core. We think that when you call us you will find us a pleasure to work with. ~ OUR PROMISE: We will NEVER try to sell you a piece of equipment unless we feel it absolutely fits your application. There are absolutely NO "Yes Men" or women for that matter working at Just Renew-It! We would rather turn down a sale then have an unhappy customer! Before you buy, we encourage you to give us a call. Put our knowledge to the test and experience the Just Renew-It! difference for yourself. Our experienced staff can quickly help you decide if the item you are looking at is right for you and again, if we feel it is not we will tell you! We routinely point customers that were looking at more expensive units to less expensive ones that better fit their needs saving them money. Being a thriving business means that we can afford to be honest. Just Renew-It! Honesty First! ~ Just Renew-It! offers a wide range of products from multiple manufactures, although virtually all of your vapor steam cleaners come from once source. Our steam cleaners, pressure washers, carpet cleaners and other products number into the hundreds. More = More Choices! ~ Other companies will sell anything to make a buck. Just Renew-It! carefully hand picks its products based on reputation. We only pick the best of the best. One example, our wet steam cleaners were invented in 1927 and was the first steam pressure washer in the world and remains a world leader in INDUSTRIAL grade steam pressure washing systems. ~ Our steam cleaners were picked for their time in service and reputation. Our vapor steam cleaner product line was the first dry vapor steam systems ever to be used or sold in the United States. Before that, there were only wet steam pressure washer systems. ~ Many other vendors only have one vapor steam cleaner that they sell! Just One! Do you really think they will try to pass you on to a bigger, better or even smaller vapor steamer when they don't carry one? If you want an honest opinion you have to have choices. ~ Other companies sell hundreds and even thousands of items both related and unrelated. These sites often have short, inadequate descriptions of there low quality plastic home use steamer products. When you call them to ask a question you find the answering service simply refers you back to the ad you called on in the first place. Just Renew-It's professionals are happy to assist you with your home or commercial steam cleaner questions. ~ Just Renew-It! has a full line of home vapor steam cleaners, commercial steam cleaners and heavy duty dry vapor industrial steam cleaner systems featuring state of the art continuous fill technology, hot chemical injection systems, integrated steam vacuums and dual heating element technology. INDUSTRY LEADER IN VAPOR STEAM CLEANERS! Best Warranty! Best Products! Best Prices! Best Service! Our Vapor Steam Cleaners Have Over 24 Years Of Service & Dependability In The US! We Also Carry The Industry Leading Elite Class Auto Detail Extractors and Carpet Extractors! Jenny Invented Wet Steam Cleaning / Pressure Washing In 1927 And Have Been An Industry Leading American Pressure Washer Company Ever Since! Record Breaking! The First & Best line of Wet & Vapor Steam Cleaner Systems Ever Sold in the United States! AN UNTOUCHABLE RECORD! Well Over 100,000 Vapor Steam Cleaners Sold! fast food restaurant to luxury cruise ships, Just Renew-It Delivers Quality Products! Join The Industrial & Commercial Steam Cleaner Revolution. 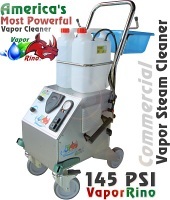 Commercial Vapor Steam Cleaners Work. Call Today!